Richard D. Peterson: Served under General Omar Bradley in the "Rubber Armoured Battallion", a unit consisting if "mock" field equiment made of rubber, cardboard, and plywood, designed to give the impression that the US force was significantly larger that it actually was. This ruse was phenomonally successful. Samual G. O'Brian: Served as a platoon leader with the 35th Infantry Division, particating in an early phase of the landing at Normandy. He later received a field commission and as a batallion staff officer participated in the liberation of France, Belgium, and Luxemborg, and in the Battle of the Bulge as well as many other campaigns in the European Theater. Jack W. McCauley: Served as a Navy Corpsman (PM3) with US Marine Corps units which participated in many invsions and other conflicts in the Pacific Theater of operations. Raymond C. Schleihs: Served as a B17 bomber pilot with the 8th Air Force, England and completed 35 missions with the 390th Bonb Group over Europe. Flew on the first shuttle mission to Russia, June 21,1944 from England with the 8th Air Force. Returned via Italy from Russia to England July 7, 1944. Bruce E. Longstreet: An infantryman who served in many skirmishes in the European Theater before being captured in the Battle of the Bulge, after which he was held captive in a German POW camp for nearly six months before being liberated at the end of hostilities. Bruce is well known for his keen sense of humor and his ability to see the lighter side of any situation. He has provided us with the authoratative recipe for "WW II Black Bread", a staple of the POW camp diet as well as his formula for the effective treatment of disentary. 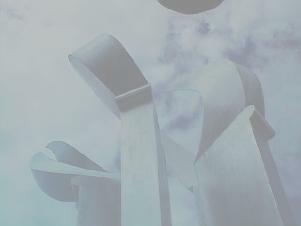 Click here for the details. Dean E. Lettington: Landed on the beach at Normandy with the 155mm Long Tom battalion and saw action throughout the European Theater including the Battle of the Bulge and the liberation of nazi death death camps before meeting with the Russians in Czechoslavakia. William E. Warrick: Completed flight training to become a Navy fighter pilot just as World War II concluded. The Sargent of Arms for this ceremony (not pictured) was Kendall Mauch. He served in the US Navy in the Pacific Theater aboard USS Casa Grande (LSD-13) and enjoyed Christmas dinner in 1945 in Tokyo. He continued his tour of the Pacific Theater after the end of WW II. 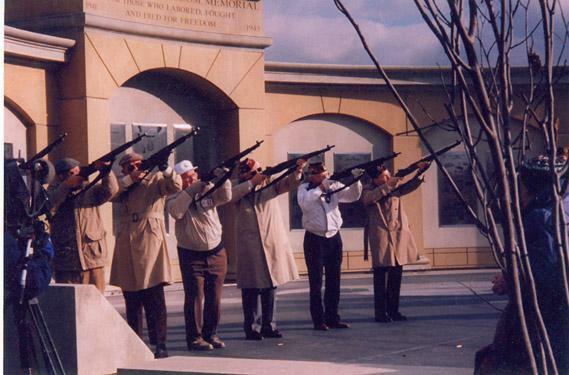 This is a photo of the Honor Guard at the Veterans Day ceremony in 1998. 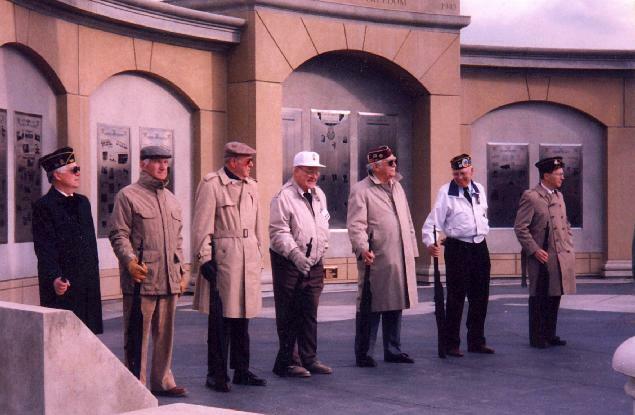 From left to right the honor guard members (and viewers) are: Nickolai Dozerist, Dean E. Lettington, William A. Lettington, Robert R. Reider, Dale W. Nelson, Robert N. Houser, Donald M. Duvick, Donald E. Lavendar, Bruce E. Longstreet, and Harold L. Payne. Nick Dozoryst: A tank commander in the European theater, he received the Bronz Star and the Purple Heart. Bill Lettington: A Team Leader in the 102nd Infantry Division in the European Theater, he was wounded in action in December of 1944. After recovery from his wounds in the UK, he served in Germany during the post-war occupation period. Bob Reider: After Army basic training, Bob was assigned to the HQ and HQ Squadron of the 17th Air Base Group at Hickam Field, Oahu, Hawaii. The Japanese attacked Pearl Harbor while Bob was serving at Schoefield Barracks. He later attended Officer Candidate School and returned to action in the Pacific during the Korean Conflict flying bombing missions for the 307th Bombardment Wing. Dale Nelson: Joining the Army on August 21, 1942, Dale served in the stateside logistics support organizations at Ft Meade, MD and Camp Funston, KS preparing troops for Pacific and European Theaters of operations. After the war ended, he served as head of recruiting for the State of Wyoming until his discharge on February 4, 1946. Don Duvick: Don joined the Army in the latter days of WWII. He served in the European Theater as a Combat Engineer with the 1265th Engr, C Bn. where his outfit worked in road and bridge repair. After VE day, the 2165th moved back to the Rhine River where they performed various missions during the occupation until his discharge in March, 1946. Don Lavendar: Don enlisted in 1943 and made the Army a career, retiring as an Colonel (O6) in 1980. Don served in the Euporpean Theater during WWII as a Rifle Squad Leader with the 9th Infantry Division. His service in Eupore earned the Cambat infantry Badge, Bronz Star, Purple Heart, and the Meritorious Service Medal with three Campain Stars (Hurtgen Forest, Bulge, Remagen Bridge Crossing, and met Russians on Elbe River). Don also plays with the All Iowa Military Band at their annual Veterans Day Concert. Harold Payne: Harold served in the Navy as a Ships Cook 3/C in the Pacific Theater from June 1943 until April, 1946. He served in the submarine relief crew on board USS Bushnell at Midway Island and later aboard USS Caiman (323), and USS Chopper (342).